Admire these fancy firs before heading into the parks. The tree in the Paradise Pier lobby glitters with underwater iconography. DAZZLE BEYOND THE GATES: Much is written, and rightly so, about the ornaments and boughs and gewgaws found around Disneyland and Disney California Adventure in November, December, and early January. There's the ginormous tree on Main Street in Disneyland, the one that always has a queue for photographs. There are the poinsettias lining the walkways, and a festive Mickey, created by flowers, seen at the entrance. And Cars Land is as twinkly as a traffic light, what with the tire wreaths hanging above the central thoroughfare. 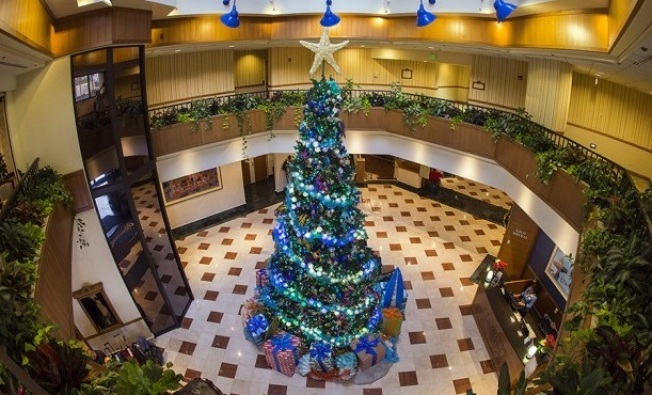 But there are decorations to admire in the hotels of Disneyland Resort, specifically the trees and touches found in the lobbies of the Grand Californian, Paradise Pier, and the Disneyland Hotel. Like anything inspired by Disney lore, and storydom, and the vivacious vibe of the Happiest Place on Earth, the hotels' holiday dress has a way of serving up a side of dazzle to what the parks have to offer. THE GRAND CALIFORNIAN TREE... is the multi-story centerpiece to the Arts & Crafts lobby, and the ornaments reflect the structure's woodsy style. There's a bit of shine, courtesy of golden, copper-cool balls, but the natural elements of the tree truly tie it to the lobby in which it sits. Add to that the oversized lanterns hanging from the tree and you have a Craftsman vision. Is there a handsome chair at one side? There is, so feel free to snap a quick family pic there. THE PARADISE PIER TREE... has a full-on, under-the-waves theme going. Jellyfish-type ornaments hang -- er, float -- from the blue-and-green tree's branches, and ornaments serve as "pearls" (very large pearls, we'll add). A woven-around ribbon adds the feel of the surf. If you put your ear to the tree, can you hear the Pacific, though? THE DISNEYLAND HOTEL... once again has a gingerbread castle to greet guests, and a sitting area, near the convention center, that's straight out of a Christmas card from 1955 (the tinsel-nifty tree adds to that feel). Will you run into Mickey there? Well, he's pretty busy come the holidays, but stopping by a resort hotel for some tree time, and a photo or two, does have a way of giving one a bit of Mickey-merry cheer.